By using the pulse of air that discharges when the pump stroke ends, we can monitor the strokes the pump has made, and use this function to do a variety of things eg. 3) Monitor Performance of Different Diaphragm Materials under different conditions eg Chemical Attack, Temperature Degradation, or Mechanical Wear. 4) Automate mixes eg, Control Primary colours in a mixing plant to make infinately variable blends depending on ratios. 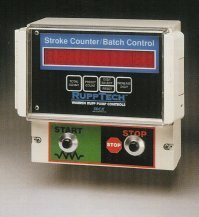 The design allows 'auto reset' of the counter or 'manual reset' for applications where the number of strokes is variable. If the air supply is intermittent the pump can continue it's countdown upon re-pressing the start button. Intrinsically safe, for those environments where electricity is unwanted. Portable, can be mounted on a trolley with the pump for ease of use. Fully adjustable from 1 to 99999 strokes. Eliminates troublesome and expensive flow-sensing devices. Runs pre-programmed batches and formulas with 1% - 3% accuracy. Tracks volume or value of pumped product for loss prevention and cost analysis. Monitors pump strokes to determine preventative maintenance schedules. More accurate than air exhaust-activated controls.